A few weeks ago, Rahul Sonnad--a serial entrepreneur who is best known for founding and selling thePlatform to Comcast--alternately confused and dazzled attendees at Twiistup, the Los Angeles tech conference, with a fake-stilted-Indian-immigrant and ukulele-singing-and-dancing studded pitch for his firm, Geodelic (www.geodelic.com). We caught Rahul in a more serious conversation, and spoke to him about his venture funded, location-based information startup and what it's up to, as well as got the story behind the firm's incubation at Clearstone Ventures. First, for folks who haven't heard of Geodelic, what do you do? Rahul Sonnad: Geodelic develops a system that lets you publish location-based information. So, if you are a business like a hotel or theme park, or want to create a campus-based experience, we have a toolset that lets you create that. For the end user, we let you find the most relevant location-based information by you. This runs on a number of platforms? Rahul Sonnad: It runs on iPhone, Google Android, and will be running on a netbook with a major OEM this April, and in the near future you'd expect it to run on HTML alone. Can you talk a bit about your prior background? 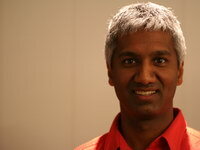 Rahul Sonnad: My background is I was in Seattle with Adobe and Microsoft in the 90's. I founded a company called thePlatform, which is sort of industrial strength video publishing. Actually, from that, I just got lots of analogies with publishing geographic specific content. I kind of thought there was a similar opportunity you see in the video space with YouTube, Hulu, thePlatform all going after. Now, when Comcast bought that company, I got a laptop with an EVDO modem and Microsoft GPS dongle, and I was always running around with 3G and GPS on a really, really smart-phone type of thing. Once I had that, it was clear to me that putting some software linking that with the Internet would be very powerful. Rahul Sonnad: We did a seed round with Clearstone Ventures, that incubated us in their Santa Monica office. We did a Series A round about a year ago in December with Shasta Ventures out of Menlo Park and Clearstone. How did the incubation part come about? Rahul Sonnad: I had just moved to Southern California, so I didn't have the largest local network here. Talking with Clearstone, because they're one of the pillars of VC down here, they said--come into our offices, we'll connect you with people and you can build out a founding team. Basically, we did that over the next five months, and we built out a really strong founding team with Keith Dutton from Shopzilla running the technical side and Ken Ng who was at Jamdat running the product and creative side. What's the next big thing for you? Rahul Sonnad: We just released this week a version where you can see some of these customized experiences, and the next big thing is to let really just anybody go to the web and create their own location-based experiences. They won't have to talk to us, they can just self-provision, it will be free, with shared revenue, or if they want to own their own advertising inventory they can do an enterprise deal with us, and pay a usage-based licensing fee.